This landmark 1920s orange building is a paradise for bibliophile and architecture addicts alike. 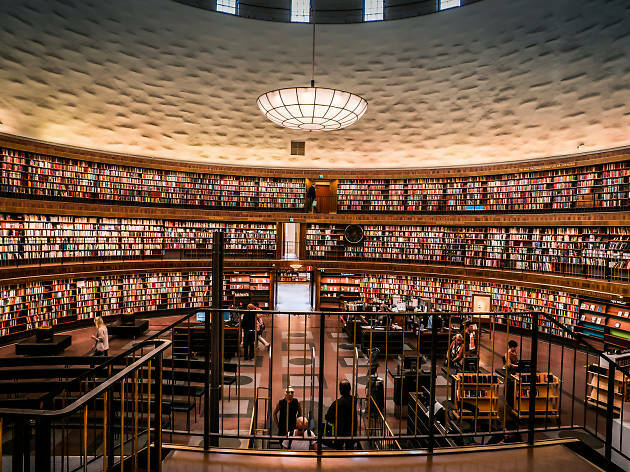 It contains upwards of 400,000 novels, textbooks, plays, poems and reference materials in multiple languages, many of them stacked from floor to ceiling around its iconic cylindrical reading tower. 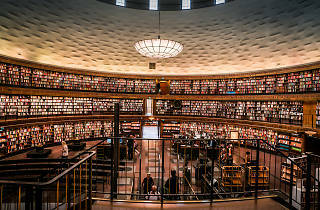 The room’s three-level design comes courtesy of Swedish architect Gunnar Asplund, whose goal was to allow visitors to browse the shelves without having to seek out help from librarians. You might feel a bit sheepish taking photos in here, but the regular bookworms and students that frequent the place are used to passing tourists. The library is open until 9pm, Monday to Thursday and 5pm on weekends. There’s a cheap café downstairs if you need some brain fuel. Time Out tip: To photograph the best angle of the rotunda’s exterior, to the large rectangular pond on Sveavägen, designed by the same architect as the library.